One thing that probably many bloggers aim to achieve is sharing their experience as and when it happens. Many great ones (read full-time) are able to achieve it. However there are many others like me who do share all experiences but with a delay. I too would love to share stories as and when it happens, but juggling between work and this isn’t easy. If you want to know the latest happenings, I suggest you follow me on Instagram. Having said that, let me finally start my series of post on my recent road trip to Ajmer from Jaipur. In my last post I shared my experience of two wheeler parking at Hyderabad Airport. It is by far the cheapest option in case you are travelling for a couple of days. Before I talk about all the places that I visited in Ajmer, here’s a quick update on Jaipur Ajmer Road trip. The roads in the entire western India are superlative. Having covered distances from Goa to Mumbai to Ahmedabad to Jaipur and finally to Delhi, I must say these are one of the finest highways in the country. And the same goes with the Jaipur Ajmer route too. The entire stretch is a four-lane road till Kishangarh. The road is a toll road and one pays around 150Rs one way. (makes sense to buy return tickets if planning to return on the same day) Also, one needs to be cautious while driving as you can find cattle, two wheelers coming in your way suddenly. The entire stretch has ample of fuel pumps on either side of the road. Apart from this, you fill find a lot of dhaba type establishments. There is one Mc Donald and one Cafe Coffee Day as far as I remember. The roads in Ajmer city are narrow and crowded. We reached Ajmer exactly by 12 pm. Maintaining the blog for the past 3 years, I'm a Foodie, Techie, Cricket Enthu, Traveler, Blogger and a Cook ! You'll find posts within a wide range of topics from food to technology.Favorite Quote: "Traveling is like reading a book, one who hasn't traveled, hasn't turned a page. This highway is indeed superlative! 🙂 You can cruise along with ease and I agree you have to watch out for the cattle. Just got back from a road trip in Rajasthan. The best way to explore is via roads! I loved my drive there. Had missed taking the turn a couple of times driving to Delhi from Ahmedabad. Luckily took it this time around. Don't miss out any posts, subscribe to our Blog ! Enter your email address to subscribe to this blog and hot and fresh posts delivered to your inbox. One of the Top Hyderabad Blogger is Socialmaharaj. The blog features fresh blog posts on wide range of topics. Travel Blog Posts, Food Blog Posts, Technology Blog Posts and everything else. Socialmaharaj is one of the leading Top Bloggers in Hyderabad. 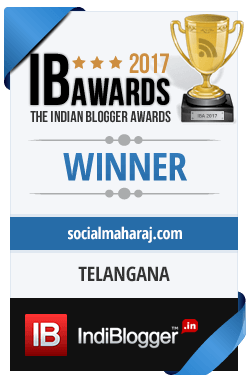 To know more about Top Hyderabad Blogger – Socialmaharaj, follow @Atulmaharaj on Twitter. For latest Instagram story by Socialmaharaj, follow @Atulmaharaj on Instagram. We also have a Business Blog, to contribute free guest post click here. Get a weekly digest of all the posts from the blog delivered right to your inbox, just a click away, Sign Up Now - We promise, we'll never spam.